Event Date :15-16, November 2017. 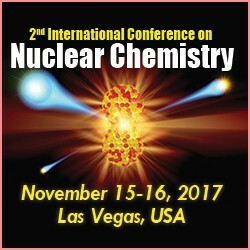 It is our great pleasure to announce the upcoming conference "2nd International Conference On Nuclear Chemistry" during November 15-16, 2017 at Las Vegas, Nevada, USA. It is a remarkable chemistry conference which brings together a unique and International mix of large and medium companies / industries, leading universities and research institutions working in the field of Nuclear chemistry. This Chemistry event is a perfect platform to share experience, foster collaborations across industry and academia, and evaluate emerging technologies across the globe. Being a part of global forum professionals in the field. We request your participation at this largest networking meet of the nuclear chemistry professionals. We believe your take home from this congress will act as a springboard for the future research and /or business development of your organization.